I love weeks like that. I was at work, in Germany, visiting the office, talking through projects, catching up with people, eating lots of sushi, and setting up strategy for the next year. Weeks like this what really makes me enjoy my job. It’s not always about big bike shows or weeks away in fancy hotels and long haul flights. Sometimes it’s just about the day to day running of the company, talking to my colleagues, catching up with them, and looking at what they’ve been working on as well show them what I’ve been working on. The majority of the time I work from home and that of course makes it very difficult to relate at times to what the rest of the company is up to. It makes working together a little bit more difficult than it should be if they were in the next room. It isn’t a real obstacle but going to Germany for a week and submerging myself in that environment really helps. It really helps morale as much as anything. I had a couple of days of meetings with the owner of the company and we really really worked through everything. Just wanted to share with you that I consider it a good week even if there aren’t a massive number of exciting things to update about. I’m now back at home lying in bed looking out the window and it’s raining. Not a good start to the weekend – means I will get very wet on my road bike. After shopping first though. Boo! Some of you will hate this post. It is about bicycles….. well work, and travelling too. In the last couple of weeks I have been to the Netherlands, a show in the UK and am now in Germany. I have visited distributors, bike retailers (with 15,000 bikes in stock!) and manufacturers. I have talked to Giant bicycles, Gazelle, Koga, Batavus and Magura. I have seen prototypes, sat in meetings about 2013 products and decided the future direction for distribution in certain countries. I am working hard and loving it. I have been riding too….. trying to get fit, because I have been signed up for Mountain Mayhem as part of our second tier team. My schedule is packed, it helps me not miss the pretty one. I am loving every minute though…. 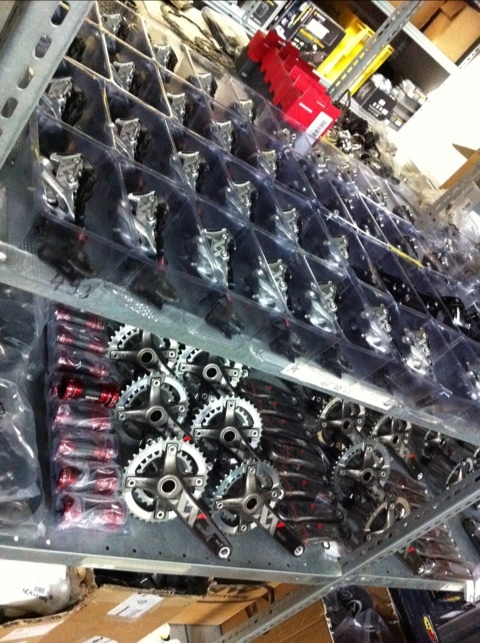 Speaking of loving it, our team mechanic is building the 2011 bikes…. I popped in to see him today…. There was this shelf…. A travelling day today. Up early and out of the door by 7.15am (I work from home, this is an early start!). Off to Heathrow terminal 1. Again I am reminded why I like T1 and Lufthansa’s setup there…. Within 5 minutes I was airside and off to the lounge for breakfast. There I got to have a bacon sandwich while sat next to Hollywood a-list (I had to ask the lounge employees who he was!). He was quiet and well behaved, although his entourage were being a little LA and self important (which of course everyone is in the business class lounge, but he was being a bit DYKWIA. Anyway, enough about Gerard Butler having breakfast sat next to me – I am now back in Germany for a week. Home, Taxi, Plane, Train, Taxi, Office, Company Car, Hotel and to sleep. Then up at 5.30am. I have tired legs. The feeling of not just one day of abuse, but two, is there – vaguely tingling. I have a week now before my next ride, so I have plenty of recovery time. Friday night was a ride with Neil and Ben. Full on muddy night ride around Swinley. Neil and Ben are team mates for 24 hr racing, and Neil works for Whyte. I met him a few years back and our paths cross every now and then at events. You recognise people, chat, Facebook each other and eventually meet up. What’s great about this job is that you are never short of good riders to have a spin with. Even if they do completely outclass me (which they did). Still, it was a great ride, and the lights are awesome (thanks EXPOSURE) so even fast singletrack is unhindered in terms of speed. We rode for a couple of hours, or perhaps less. All I know was that the pace and some of the steep climbs really caused me to feel the burn. Knowing that I am in Germany this coming week allows me to recover a little. In order to make that worthwhile, today I am at my parents place. Road bike was the tool of choice, so I set off into Somerset. This area doesn’t do flat. A 53km loop results in 450m climbed. Not much by mountain standards, but these are short sharp climbs. It was breezy and got cold too. A proper workout for me, with yesterday still in my legs. I will perhaps vainly take the running shoes to Germany – but it will be a busy trip, flying in on Monday, driving to Stuttgart on Tuesday (going to Magura) with work and friends to catch up with in Koblenz before flying back on Friday. No plans for next weekend yet though – perhaps it will involve a bike?! Those of you who know me will know that music has always been important to me. At age 18, I saved up enough money to buy a cheap car, instead though I borrowed my brother’s battered car (my parents didn’t think I was being wise with my money so refused the loan of either of their cars) and drove a round trip of about 140 miles to go and buy a ‘proper’ separates hi-fi. My rooms at university were always set up with the bed in the sweet spot between the speakers, and I had a completely different setup for my decks (which I sold years ago and regret)! When I was in Switzerland, one of the first things I purchased was a little Sony CD Player / Stereo which was for my room. That little machine came with me to Austria too. For many years it was in my room at my parents house, and they have now kidnapped it and taken it to France. When The Pretty One and I bought our flat, I insisted that the TV goes flat against the wall and the speakers are stand mounted each side of it (I bought new ones) so the middle of the sofa is the sweetspot. The speakers amazed me and reminded me that actually purchasing higher quality hifi components will actually allow you to experience more of the music. It is like listening through new ears. Whether or not the majority of people agree with me or not, I don’t care. I feel you have to live with a system to really appreciate it too. Just popping over for a listen wont reveal everything. Since purchasing the speakers, I have been telling myself that the amplifier and (to my shame) the DVD player being used to spin the CDs which I still buy and enjoy needed to be upgraded. I even went as far as buying a couple of magazines to research which amps and cd players mate nicely with my speakers. A couple of days ago I pulled the trigger. I found the deal that I wanted and bought what is still a fairly entry to mid level system. Once again, all of my music sounds brand new. The same brilliant and familiar music, but through new ears. More controlled. Just more music. It is amazing. This is a 14 year old girl playing and singing. This is the Foals – Thanks to Tracey for suggesting I listen to them. The sun was out all day, and I was just about to go out on the bike when The Pretty One called. By the time I got out it was dusk. 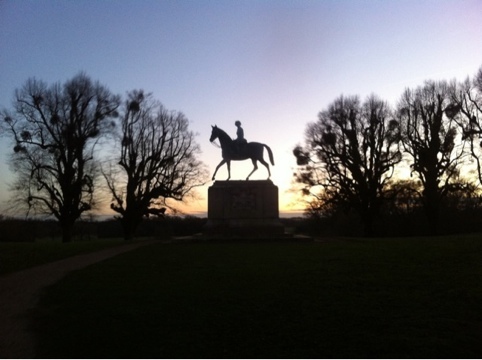 I managed to get a couple of laps around Windsor Great Park. Got a beautiful photograph too.